MONTEBELLUNA, Italy - A landmark industrial building in the quiet Italian town of Montebelluna (TV), previously used as a tobacco drying plant, has been lovingly converted into the Mattorosso KMØ Restaurant & Live Bar by Spolverato Umberto and Bressan Lorella, owners of the architecturally superb (and historically significant) edifice. The building also incorporates one of Italy's biggest MI shops, Esse Music Store. The conversion has been implemented with the help of a technical infrastructure masterminded by HARMAN Professional distributors, Leading Technologies, and featuring many of the corporation's premier brands. Venue managers Manuel and Claudio recall that when they first visited the site at the end of 2011 the brickwork was scored by lime and black carbon; but they say that thereafter "the building's owners spared no effort or commitment in reconditioning the building and making it fit for purpose." 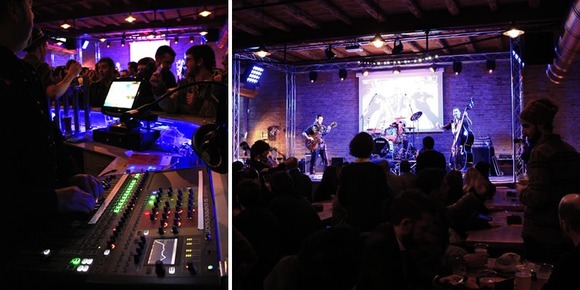 Leading Technologies soon became involved in the project and put together an industry-standard sound reinforcement specification within the budget for the 300-capacity venue. Consultant, Paolo Michelini, discussed the design in conjunction with Leading Technologies' engineers and the building was divided into two indoor zones and one external, ensuring that the sound generated in the live room could also be distributed evenly outdoors. "The concept was straightforward," says Leading Technologies' product specialist, Marco Roveri. "We looked at the project and listened to the owners' ideas before making our recommendations." At the main industrial entrance they have suspended four JBL Control 67P/T pendant loudspeakers from the pitched corrugated roof; these incorporate a large enclosure and high-power 6.5" transducer for extended bass and high-fidelity performance, while the large RBI Radiation Boundary Integrator™provides outstanding pattern control, which can allow fewer speakers to cover a venue. In the main live room Leading Technologies specified four JBL VRX932LAP powered, compact 12" two-way line-array elements, flown two per side, and four ground-stacked VRX918SP bass reflex subs, recessed back into the stage. PRX612 self-powered 12", two-way speakers and PRX415 15" two-way speaker are used for stage monitoring (with two of the latter deployed for drum fills). Sound engineers also enjoy the presence of a Soundcraft house desk. Leading Technologies recommended the popular Soundcraft Si Expression 2 console, featuring 24 recallable mic pre amps, and MADI optical card expansion, with I/O capacity extended via a Compact Stagebox (32/16). Summing up, Roveri says, "Many companies competed for this contract as they wanted to work in that prestigious building, but the owners chose Leading Technologies for the brands they represent and the back-up they knew they would get. They are extremely happy with the result ... as were we, when we heard the system fired up on the opening night."